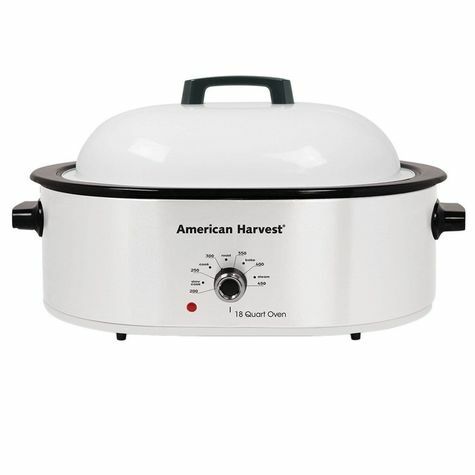 The Nesco MWR18-14 is a 18-Quart American Harvest Roaster Oven. This roaster holds up to a 24 lb. turkey, and comes with a power rating of 1450 watts. It has powder paint white housing and is ideal for large meals and entertaining in the home. The rack has convenient lift-out handles. The removable cookwell can be stored in the refrigerator and washed in a dishwasher. The Roaster has adjustable full-range temperature control from 200 F to 450 F .
The Nesco 18 QT. WHITE ROASTER PORCELAIN COOK has many exciting features for users of all types. You can extend the lifetime of your Nesco 18 QT. WHITE ROASTER PORCELAIN COOK with the purchase of a FactoryOutletStore Factory Protection Plan. 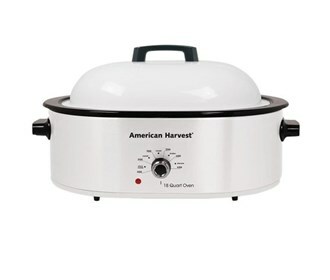 See the Nesco 18 QT. WHITE ROASTER PORCELAIN COOK gallery images above for more product views. The Nesco 18 QT. WHITE ROASTER PORCELAIN COOK is sold as a Brand New Unopened Item.